Last weekend we had my twin girls 2nd birthday. 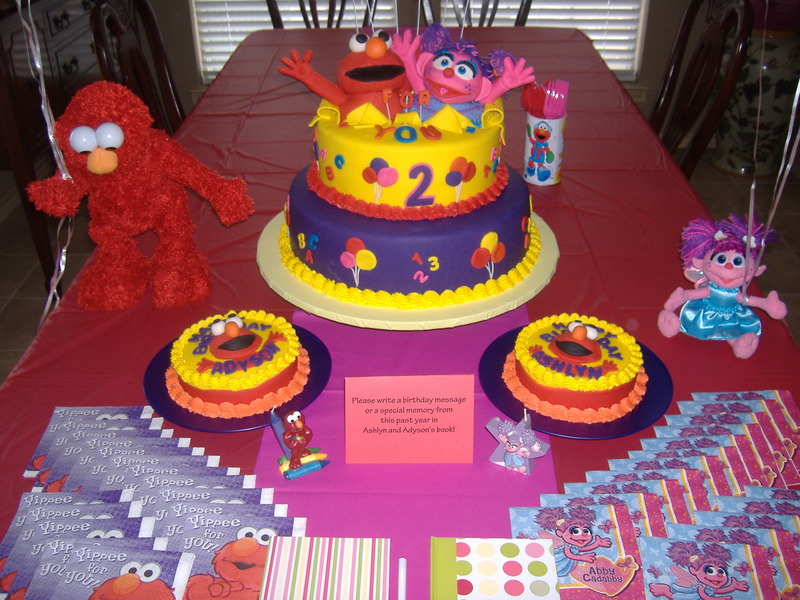 They are obsessed with Elmo and Abby so even though I had many other theme ideas for twins I did something that I knew they would be excited about! Here is the set up of the table with the cake on it. I am so lucky to have some of the best cakes made for my girls! 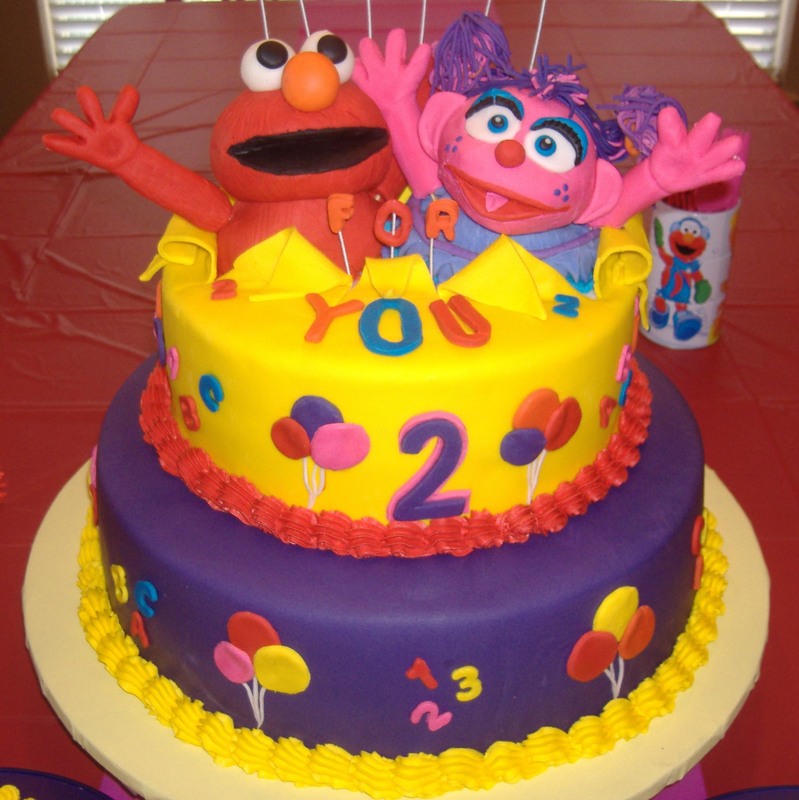 This cake was two layers with Elmo and Abby coming out of the top layer. They also each had an individual cake so they could blow out their own candles and enjoy some cake on their own. I used paper lanterns to decorate above the table. I added a face to the center one to look like Elmo. 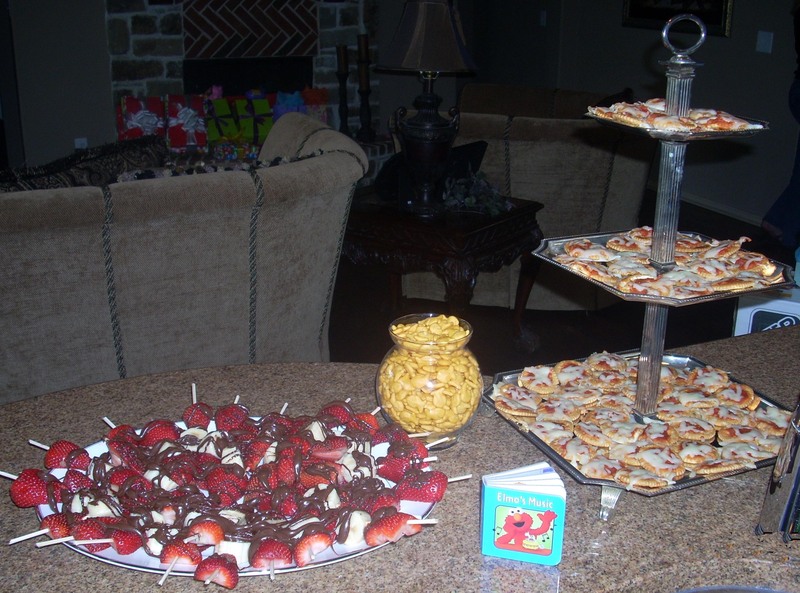 The party was in the afternoon so I just had snack foods set out. Since pizza is Elmo’s favorite food, I served mini pizzas that I made with crackers. Elmo also loves bananas and fruit so I served banana and strawberry kabobs drizzled with chocolate. Elmo has a pet fish, Dorthy, so of course there were gold fish in a bowl. 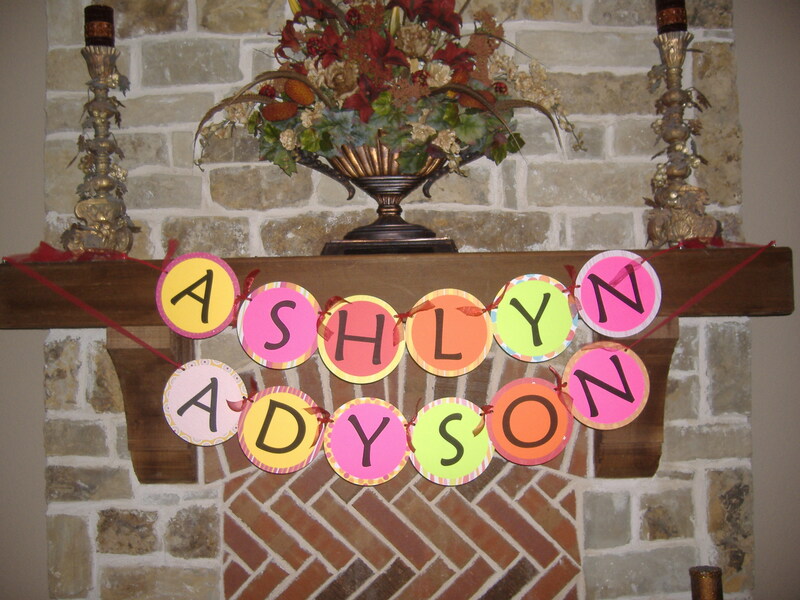 I made banners with their names on them to hang on the mantel with the presents. Here is a close up of the shirts that I made for them to wear at the party. We had an Elmo pinata for all of the kids to enjoy. Obviously, the pinata was bigger than the girls. For party favors, I made Elmo and Abby bags and filled them with cookies, gold fish, crayons and elmo and abby bracelets. The party was a lot of fun but the best part was seeing the girls faces when they first saw all of the decorations when they woke up from their nap. They were so excited and that is PRICELESS! Sooo cute. I love the paper lantern Elmo!! What an awesome party!! 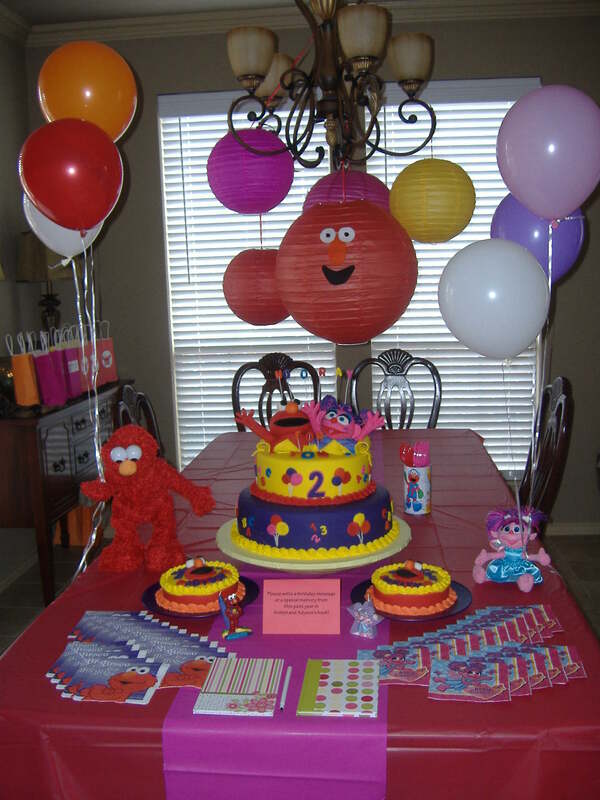 The cake and Elmo lanterns are so great. I love that he’s holding balloons too! 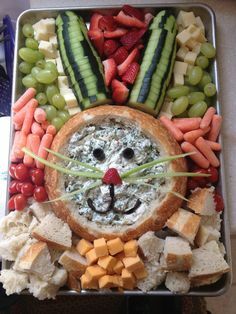 What a fun and adorable party!!! !